The Second Economic and Social Council (ECOSOC) forum on financing for development follow-up (FfD forum) was held from 22 to 25 May 2017 in New York. The forum’s extensive programme included: a ministerial segment featuring the special high-level meeting with the Bretton Woods institutions, the World Trade Organization (WTO) and the United Nations Conference on Trade and Development (UNCTAD), general debate and ministerial roundtables; and an expert segment organized around a series of round tables and panel discussions on themes spanning the entire scope of the Addis Ababa Action Agenda (Addis Agenda). The FfD forum resulted in intergovernmentally agreed conclusions and recommendations (included in E/FFDF/2017/3) which provided input to the High-level Political Forum on Sustainable Development. The 26-paragraph outcome document reaffirms key elements of the Addis Agenda, and contains new commitments on policies and actions to ensure the full and timely delivery of the means of implementation of the SDGs. 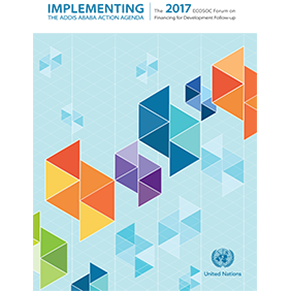 The 2017 report of the Inter-Agency Task Force on Financing for Development provided an important input to the negotiations of the outcome document and to the discussions at the FfD forum itself. Building on the official summary of the forum by the President of ECOSOC (A/72/114-E/2017/75) this publication provides detailed coverage of the substantive discussions at the 2017 FfD forum. It also includes a series of annexes containing summaries of the side events held during the forum and other relevant documents.